Rohan’s project for Cortona Academy’s Award Program. 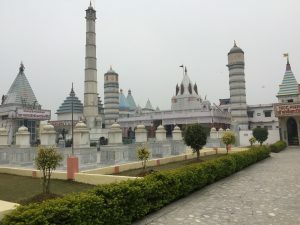 Research about Shikharji, nearby temples, and Nalanda University – plan on how and when to get there, where to stay and what to do there. Make travel reservation from Hyderabad, Andhra Pradesh to Ranchi, Jharkhand. Travel from Ranchi to the town of Madhuban on the foothills of Shikharji on first day. Make return trip to Ahmedabad. to know that Nalanda University (a UNESCO world heritage site) is only 230 kilometers (km) from Sammed Shikharji. So we included that in our trip. ew from D.C to Ahmedabad, India and we stayed there for few days with my cousins and relatives. Day 1: Shikharji is located on Parasnath hill and accessible through the town of Madhuban (foothills of Shikharji). There is no direct flight to Shikharji; we flew to Ranchi, Jharkhand on December 14, 2018. My cousin, Matangi, from Ahmedabad joined us in Ranchi for the trip. It is 163 Kilometers and takes four hours by car from Ranchi to Shikharji. We hired a taxi. Our driver was a local person and knew the area really well. He advised that we had to go through the jungle, rugged terrain, and due to fear of robbery, we must reach Madhuban before sunset. We started two hours late than we planned because of the delay in arrival of my cousin’s flight. We were really scared so we were started praying and luckily we made it through safely and reachedby 8:00pm. The town of Madhuban do not have hotels, so we had to stay in a dharamshala (a lodge for pilgrims where you do not have a con venience of a hotel). We did not make reservation, so it took us an hour and half to take a room in a dharamshala. The dharamshala has in-house Bhojnalaya (place serving vegetarian food) and they closed before sunset. We had some snacks with us, so ate and went to sleep at 11pm. Day 2: We visited many ancient temples in the town of Madhuban, Jain Museum, and local market (the Bazaar) in the afternoon. The museum walls exhibits pictures of Jain architecture and it’s the only place where you see the collection of all the postage stamps issued on Jainism. 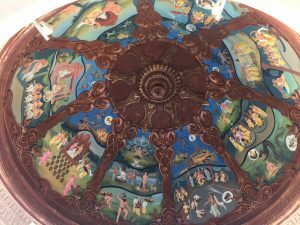 We saw ancient artwork made of ivory and sandalwood on the first floor. The second floor of the museum depicts special events occurred in Jainism. I was really fascinated by beautiful idols of tirthankaras, sculptures and architecture of the temples. I have never seen such beautiful artwork before in my life. Even the walls and floors were decorated with beautiful paintings. We bought important items needed for the trek such as: a walking stick, water bottles, torch and a pair of thick socks. It is important to take a good rest before starting a 27km trek. Since there are no facilities are available to stay overnight, we decided to start at 2:30am and complete the trek in one day. We ate early dinner and went to bed around 8pm. I was both excited and nervous for the next day. I was aware of the large distance that we all had to walk. We woke up at 1:30am, took shower and started off at 2:30am. When I visited that place, it was the month of December. As expected, it was cold too. So, I decided to wear my coat. We were given a small pouch for keeping rice, almonds, and cloves for puja (worship lords at the temples) and a small booklet with all the required mantra (chants) from the dharamshala. As soon as we reached the base, I was surprised to see hundreds of people eagerly going uphill. We followed them. My cousin and I decided to complete the trek on our own, so we went separate ways than my parents. There were no lights on the route. There were no formal restrooms on the trail route. The path was narrow and filled with small pebbles. The socks we had put on provided some comfort. It was dark, very dark indeed! Most of the people had torches, so we never fell short of light anywhere. The route is uphill right from the beginning, with some flat sections and some downhill sections. After 5 minutes or so, people started singing beautiful prayers. That kind of thing helps you bond with people. We eventually started singing too. I was tired, but here’s where you see the best that comes out in you when people around you are encouraging and supporting. 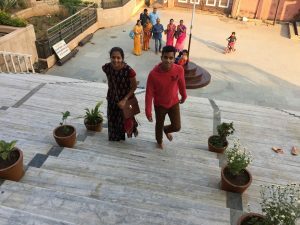 People walked very fast to visit the first temple. You meet all kinds of people there, those who sing, those who trek barefoot, those on dolis (employ people to carry old people and babies in palanquin), those who drag and even those sit tired. We decided not to eat anything but take water as we needed until we finish the trek. There were stalls for food and drinks and had cots to take rest, but we had to keep moving because we were still very far away. It is advisable to reach the first temple of the trek, Chopra Kund by the time of sunrise. We were a little late, but we continued. Here we met my parents who had arrived. This was the last time we saw them during the trek. From Chopra Kund, the series of tonks starts, which are the actual places where Tirthankaras attained moksha (enlightenment). Starting from the Gautam Gandhar Tonk, and ending finally at the Parasnath Tonk. As we moved up the sun started to rise and there was sunlight and we reached the first tonk by 8:00am. The sunshine mixed with fog made the view look like it was shot in the heaven. Then, we took some rest for 15 minutes. I was thirsty and had some water mixed with lemon. Slowly, we continued the trip to each tonk, which took hours. We took some rest stops of 10 minutes as needed. After Gautam Gandhar tonk, the next important milestones of the trek were Chandaprabhu Tonk, Jal Mandir, and finally Parasnath Tonk. We faced extreme weather condition as we moved up to the Chandraprabhu tonk on the eastern part of the mountains. It was extremely windy and chilly; we had to cover our heads with hood. I felt like I was in January wintery weather of Virginia. Since we had the jacket, we could bear it a bit, but we saw so many people felt the cold and were taking rest inside the temple. Some even started to go back to the base. It started to get better as we moved to western side of the hill. We stopped at Jal Mandir, which was recently built. The architecture of the temple was simply amazing; along the wall there are statues of tirthankaras and the ceiling looked like an upside down lotus flower. We were not permitted to take any photos of this temple. We saw pilgrims taking a much needed break and enjoying tea or lemonade. 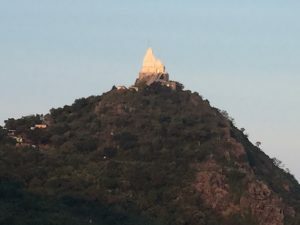 We continued walking towards the final point of the trek, Lord Parasnath Tonk. Initial path to the last tonk was rocky and unpaved. After a while, it was a cobblestone track with shady trees and then about 300 steps to the temple. Finally we reached Parasnath tonk by 1:30pm. i.e. 11 hours after the start of trek. Extremely tired by then, I looked at the idol of Lord Parasnath while sitting and doing puja, I felt so relieved from the exhaustion. Inside the main hall of the temple, we sat and sang prayers from small books. The hood of serpents that protects him easily identifies Lord Parasnath. The amazing architecture of temples and delicate embroidery on shikhar and carvings of the ceilings inside the temple mesmerized me. Temple walls and even the floor are decorated with designs and paintings. From the top of the hill, I looked around at the plains below and the hills spreading towards east. It was quite a beautiful and wonderful sight. We sat down for a few minutes longer than we should have and suddenly realized we need to go down before it becomes dark. We started return journey from Parasnath Tonk around 2:30pm and it was a bit easy due to descent and path in good condition. We continued onwards and within a kilometer, on both side of the path, there were trees. It was such a blessing to find some shade from the bright sun. A walking stick is very helpful going downhill. We had to reach the base before it’s dark. We gathered all our strength and increased the pace. After an hour and half non-stop walking, we reached Gandharva Nala, a rest stop for pilgrims. Free sweets and snacks were being distributed by a trust and it was a blessing for us. The sun started going down behind the hills. We continued afterwards and saw a board showing we still had to go down about 5 km. For the final few kilometers we both were encouraging each other. The last few kilometers were a bit painful, but we did not lose hope. Finally we reached the base at 5:30pm, we were waiting for my parents to arrive but they already reached dharamshala using dolis on their return journey. After taking some refreshments, we took an auto and reached the dharamshala at 6:00pm. I was so exhausted and hungry; we ate, talked for a while and went to sleep at 8:00pm. I woke up at 7:00am next day, slept for 11 hours. We completed the whole trek on foot itself. All people may not cover all the tonks based on their strength, stamina, and time in a day but we did. A few people took the shorter path in order to complete the trek on time due to bad weather. Though we both were tired, we decided to not skip any part of the trek or a tonk. During our decent, I saw poor people asking for food and money. Their huts made of mud and so small probably less than 50 square feet. This made me realize how fortunate I am to have comforts of life and leaving in a good condition. This really made me almost cry and told my father to arrange food for them. There are places that serve food for them, so we paid and made an arrangement to provide meals for them. We also donated money for “Jeev-Daya” to the organization, which helps feeding birds, feeding and caring for sick and elderly animals, and setting them free from slaughterhouses. It was a very tiring and challenging trek. Thousands of Jains including young children and older people come here every year for the pilgrimage. It was great to see how unknown people get united and support each other. I have never walked 27km up and downhill ever in my life, but still I was able to complete it. I was really surprised by the hidden capabilities of my body. The feeling when you reach at the Parasnath Tonk is simply amazing, and I have no words to explain such a feeling. You have to be there to experience such a peaceful and divine feeling. Also the view is mesmerizing. The Madhuban Forests, Shikharji hills, white temples and tonks scattered at various locations creates beautiful scenery. The feeling of accomplishment you get, once you reach at the bottom, is something that no other accomplishment can replace. Shikharji Yatra is the most important pilgrimage for Jains, and having completed it successfully is a proud feeling. I had the cell phone but did not use at all other than taking only few pictures, I realize that some things in life are better enjoyed without involving technology. I am so thankful to God that we met wonderful people and complete my Yatra without any problem. After Shikharji, we continued our trip next day by taxi to various other Jain religious sites in state of Bihar such as Rajgir, and Kundalpur. We had breakfast and left for Rajgir at 9:00am and reached there by 1:30pm. Since I was tired from long trek day before, I slept in the taxi throughout the travel to Rajgir. 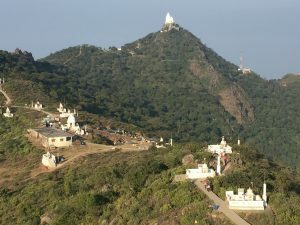 The name Rajgir was derived from Rajagriha “house of the king” and was capital of city of the Magadha kings during the Mauryan Empire. 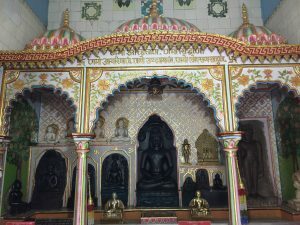 It is an important Buddhist and Jain pilgrimage site. We visited Vishwa Shanti Stupa (World Peace Pagoda) that is a place for worship and known for spreading the teachings of Lord Buddha for peace and harmony among people. The Stupa is on the top of the hill and we took a ropeway to get there. Then we had to go almost 300 steps uphill. It is made of white marble and is the tallest peace Pagoda in the world. It was very clean and spotless with an amazing view of the valley. The Stupa has four statues of Lord Buddha on the four sides, which tells the four phases of life of Lord Buddha. These statues are made of gold depicting birth, enlightenment, teaching and death of Lord Buddha. main buildings nine stories tall, and had all Buddhist knowledge in the world at that time. The library had books on religion, literature, astrology, astronomy, and medicine. Nalanda University was destroyed by Turkic invader, Bakhtiyar Khilji in 1193 and that started decline of Buddhism. The great library of Nalanda University was so big it burned for three months after the Mughals put it on fire. They destroyed the monasteries, killed monks and drove rest of them out of Nalanda. It was eventually abandoned and forgotten. Now the university and Rajgir has become Buddhist tourist place. Finally we visited Kundalpur just 18 km from Rajgir. Kundalpur is a birthplace of Lord Mahavira, the 24th tirthankara. There is a huge magnificent temple with beautiful spires and pictures of 16 dreams seen by his mother Trishala before his birth. 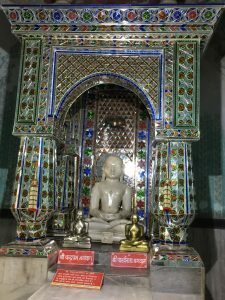 Also we saw images of Gautam Ganadhara, the chief translator of lord Mahavira teachings and an art gallery of photos related to Mahavira’s life at Rajgir. Lord Mahavira attained Moksha at Pawapur, which is located in Nalanda. We stayed overnight in dharamshala in Rajgir. Next day we had to go to Patna, 105 km from Rajgir. Following the visit of Rajgir, we reached Patna by taxi to catch a flight to Ahmedabad. On the way to the Patna airport, I saw the city was so crowded with people, very old houses, and crowded airport. The security line was so big that I was afraid of missing the flight. We flew to Ahmedabad with a shortstop at Calcutta airport. Interestingly we saw so many Buddhist followers including monks visiting Rajgir to study their own heritage. I knew the principles about Jainism before the trip. I came to know so many things about my cultural heritage especially details about all idols and their salvation. Since we stayed in dharamshala, we had to follow timings for lunch and dinner. In fact we missed dinner for the first day and lunch next day. We did not have luxuries normally you have in hotels. I became more compassionate and realized how people live their lives with little things they have. I also learned history about Buddhism. I came to know that every living being has right to exist and to live in harmony. This trip encouraged me to learn more about my religion, Jainism. In 19th century, the university site was surveyed and the Archaeological Survey of India conducted preliminary excavations. Further excavations in 1915 and 1972 provided details about eleven monasteries and six brick temples neatly arranged on grounds of 34 acres in area. The archaeologists found manuscripts, sculptures, coins, seals, and inscriptions in the ruins and they are on display at the Nalanda Archaeological Museum. Former president of India APJ Abdul Kalam and former Chief Minister of Bihar Nitish kumar took steps in 2006 to the revive the oldest university. At the same time Singapore submitted a proposal called “Nalanda Proposal” to the Government of India for establishment of the Nalanda University. The State Government of Bihar consulted the Government of India, identified 450 acres of land and then acquired for the University in Rajgir. I came to know that other Asian countries and Mauritius signed agreement on revival of the Nalanda University. Its interim campus started near the railway station in Rajgir and the first academic session was held in September 2014. The main campus construction has started since year 2017 and it might take probably five years to be completed. Currently the university is offering courses in the School of Historical Studies, the School of Ecology and Environment Studies and the School of Buddhist Studies, Philosophy and Comparative Religions. In the coming years Nalanda will establish five more Schools: Linguistics and Literature, International Relations and Peace Studies, Information Science and Technology, Economics and Management, and Public Health.